The knee is the largest joint in the body. The knee joint has two crescent-shaped cartilage menisci, one inside (medial) and another on the outside (lateral) of the knee. The menisci stabilize the joint, absorbs shock, and disperse lubrication known as a synovial fluid. They are essential for an efficient functioning of the knee. A meniscus injury can lead to critical impairment and overall biomechanics of the knee joint. Meniscus tear is the most common knee joint injury. The motions that require pivoting, twisting, over-flexing the knee and sports with sudden stops (tennis, basketball) may cause meniscus damage. The most commonly injured meniscus is the one on the inner side of the knee, the medial meniscus. Meniscus tear onset of symptoms are gradual. The pain is in the inner side of knee and you may hear or feel a pop sound when the injury happened. The knee joint may also click and lock and feel that it is giving away. It may also be swollen and is hard to straighten up. A blood supply on the meniscus in very poor, and that’s why the meniscus injury heals slowly. If you are an athlete and want to continue your sport, you may need an arthroscopic surgery. If you are middle aged and not that active anymore, the rehabilitation with physical therapy or even pilates with a physical therapist are good ways to rehabilitate your knee injury. Knee rehabilitation with or without arthroscopic surgery should focus on re-gaining knee’s normal range of motion, enhancing strength of quadriceps (especially vastus lateralis and medialis) and hamstrings muscles and decreasing unnecessary muscle tightness of IT-band and hamstrings muscles. Close attention should also be paid to the overall muscle control, coordination, balance and proprioception. meniscus tear and knee injury. While traditional physical therapy helps you with your knee injury and pain, with Pilates you are going to rehabilitate and strengthen your whole body and prevent efficiently re-injuries by correcting your faulty movement and compensation patterns and improving your overall alignment and posture. We in Pilates rehabilitate the root of pain and injury, not only injury itself and that is what makes the difference resulting a pain and injury free body. Therapeutic / Clinical Pilates rehabilitate and prevent at same time. Pilates is something you should seriously consider when you need a rehabilitation or post-op rehabilitation on your knee injury. Did you know that one reason for your ongoing pain might be caused by muscle imbalances? Did you know that having a muscle imbalance might be even the root of injury and chronic muscle and joint pain? Muscle imbalances affect the alignment of musculoskeletal system causing poor alignment. Poor alignment put a lot of pressure on your body’s tendons and ligaments leading to impingements and inefficient biomechanics. The muscle imbalance can be the cause of any muscle, fascia, metabolic or mechanical postural dysfunction and syndromes. Lower back pain – decreased range of motion in hip extension and internal rotation, hip extensor weakness for female, weak deep back & abdominal stabilizer muscles, hamstring & hip flexors tightness. Injury and pain also causes problems for your neurological connection between brain and muscles, and body start to compensate. Faulty & habitual compensation patterns leads to even more pain and risk of re-injury by creating more altered alignment in the joint, tendons, ligaments and muscles. Over compensation and muscle imbalance do not show on the X-ray or MRI but they might still be the real root reason of your pain and re-injury. Do not overlook your muscle balance, it is a vital component to injury prevention and rehabilitation from injury. It is very true that by restoring your muscle balance you can tremendously decrease your pain and risk of re-injury! Pilates private sessions are a wonderful tool to rehabilitate your body after injury or Physical Therapy. It’s gentle and low-impact exercise form where your body can heal without putting too much pressure on your injury side but still working out your whole body. After injury your muscles learn to work different, inefficient way and sometimes you will need professional eyes to correct your faulty muscle recruitment and faulty compensation patterns. These two issues make your healing process much more complicated and risk of other injuries increases if you don’t notice how you are actually using your body. Already about 70 years ago during the second world war Mr. Pilates developed his method to treat soldiers who were injured at the war. He created a specific hospital bed where he used resistance of springs and bands. He was very clever guy and really ahead of his time. Pilates is today a great and practical tool for rehabilitation and many Physical Therapist as well as Chiropractors have noticed that. However, many Pilates studios are owned by certified Pilates Instructors who unfortunately have very limited knowledgeable about orthopedic rehabilitation or post-rehabilitation. Pilates Instructors might want to grow their businesses so badly that they are willing to take clients who have many health problems, but don’t exactly know how to deal with those problems. I see a big risk of injury or re-injury here! Pilates is a really good rehabilitation tool but Pilates instructors would need much more education about anatomy, biomechanics and orthopedic injuries & rehab than the standard comprehensive Pilates education offers today. For example, all back pain is not the same, and Pilates instructor who has had back pain herself and recovered from it by doing Pilates, is not necessary a good teacher to teach other people with back problems. Pilates is a good tool, but the teacher has to know exactly how to use that tool properly, efficiently and safely for each client. People with back pain have usually more problems and issues than just weak core muscles. Very often Physical Therapists and Chiropractors don’t know about how long the Pilates instructors education is and how little they actually know about anatomy, injuries and rehabilitation. As a Physical Therapist myself, I was very surprised when I heard that one chiropractor referred his client of age 88, has osteoporosis and two lumbar vertebrae fractures, to a Pilates Instructor. I know that this Pilates instructor was very experienced, but not educated as a Physical Therapist, and I don’t think that this client was general ‘Pilates material‘. Pilates is a great and versatile exercise tool but in this case only taught by a skilled Physical Therapist. Pilates Instructors are expected to know what their skill level is and where their limits are. Unfortunately, today’s economy puts a lot of pressure on Pilates business owners, and even though they don’t have enough education they will take and treat rehab clients as any other normal clients. If you are looking for a Pilates studio to rehabilitate your injury or post-rehab after Physical Therapy, do your homework first and ask questions from studio’s instructors to find out how skilled and experienced they really are for your case. I definitely recommend Pilates for everyone who is looking for rehabilitation or post-rehabilitation after Physical Therapy – just be sure that your instructor is really experienced and educated in that field. For more about PilatesWise active back rehabilitation, orthopedic injury rehabilitation and sport injury recover and prevention, please visti our website http://www.pilateswise.com . What is common between Lupus, Rheumatoid Arthritis and Multiple Sclerosis (MS)? They all are autoimmune diseases, where your own cells start to attack your healthy tissues and organs. There are over eighty autoimmune diseases, each with it’s own unique symptoms. Lupus and Rheumatoid arthritis symptoms are similar; painful and inflamed joints, extreme fatigue, anxiety and depression. People with Multiple sclerosis have a little different problems like loss of muscle strength, sensation, coordination and balance. All these three diseases consist of pain which make life more complicated and can make everyday life more challenging both physically and psychologically. When your muscles and joints hurts, it’s definitely not the first thing on your mind to get up and move. However, a proper exercise program is one of the treatments for all those three diseases. Inactivity and disuse cause more pain and discomfort in your body. Disused muscles become weak by supporting less your joints and making your joints more instable which causes even more pain. Disused joints (while they are stiff and painful), reduce joints’ range of motion which also increases pain. Lack of exercise has also found to be related to fatigue and overall stress of your body which makes it harder to cope with your symptoms. Regular exercise program has many benefits by improving your body function and mood while reducing stress, fatigue and pain. Pilates is a great exercise form for clients with Lupus, Rheumatoid Arthritis and Multiple Sclerosis. Pilates is low-impact, gentle and gradually progressive. Unfortunately, Pilates exercises should be taught preferably by a Physical Therapist. Pilates Instructors in general do not usually have enough experience in these three conditions and how they affect your joints, muscles and neuro-muscle control. Pilates Instructors who have dancers or fitness background find often difficult to understand Lupus, Rheumatoid Arthritis and Multiple Sclerosis special needs and conditions. You simply can’t teach client who has pain and inflamed joints (Lupus, RA) or who has coordination and balance problems (MS) the same way as regular fitness clients. Pilates Instructors are not therapists and oftentimes a too confident Pilates Instructor without experience can make the client overdo the exercises and cause flare-up because it’s too much too soon. Pilates program should be specifically designed based on every client’s individual condition, limitation and needs. Without a proper education and experience that is obviously pretty hard to do. If the Lupus and Rheumatoid Arthritis client has painful and inflamed joints, it’s important to maintain proper range of motion of joints and not put too much pressure on inflamed joints. Sometimes it is enough to do just isometric exercises which means muscle contraction without joint movements. Multiple Sclerosis client needs carefully assisted movements due to muscle weakness and co-ordination difficulties. There are many Pilates movements in Pilates repertoire which is very beneficial but maybe sometimes not enough. That’s why I warmly recommended to find a Pilates program where trained Physical Therapist is teaching and makes safely modifications based on each client’s current needs and also uses therapeutic exercise techniques as needed. A well designed Pilates and exercise program will definitely promote your physical and emotional well-being and quality of life. The fascia is a thick elastic connective tissue in and around the muscles, bones, blood vessels and nerves of your body. The fascia spreads throughout the body like web which travels head-to-toe uninterrupted and acts as a shock absorber in the body. In healthy condition, the fascia is relaxed and wavy in configuration with the ability to stretch and move without any problems. Physical trauma, scarring, stress, repetitive micro trauma, poor posture, inflammation or disease such as arthritis cause the fascia to lose its ability and this causes restriction and tension to the rest of the body. This Myofascial restriction or tension is the underlying cause of most chronic pain problems that have not responded to traditional medical or surgical intervention. Myofascial Pain Syndrome (MPS) is essentially defined as a painful musculoskeletal condition, characterized by the development of Myofascial trigger points (TrPs). These points are locally tender when active and refer pain through specific patterns to other areas of the body. The Myofascial tissue appears to tighten and thicken in those with Fibromyalgia syndrome (FMS). So often fibromyalgia sufferers might have also Myoafascial Pain syndrome (MPS). FMS and MPS are very different symptoms and makes life very complicated with pain. Exercise is considered to be one of the most significant treatment methods for relief from the symptoms of Myofascial Pain Syndrome as well as Fibromyalgia. Research indicates that apart from medications and minimally invasive techniques, a set of planned exercises and a regular exercise regimen can be of great help for relief from the symptoms of Myofascial Pain Syndrome. As a Physical Therapist, I recommend Pilates and specific stretching program for people with MPS and FMS. However, both exercises have to be tailored just for you needs and must be taught by a Physical Therapist or experienced Pilates Instructor. Pilates helps improve your joint range of motion and increase muscle strength, endurance and stretch. Unfortunately, Pilates is not enough to stretching tight myofascia and releasing muscle tension. Specific stretching program with a foam roll and ball is a good myofascial trigger point release as well as muscle tension release. So, professional Pilates with a specific stretching program complete each other by relieving your pain and will improve your quality of life. PilatesWise offers Pilates and therapeutic exercise program for rehabilitation, post-rehabilitation and chronic pain & disease, all sessions are taught by a Physical Therapist. Many gym goers are focusing on flatten stomach, tone arms and legs or maybe trying to improve their sports performance with strength training. Unfortunately, most fitness enthusiasts and athletes pay too little attention to the structure, stability and alignment of their body. It’s not cool to have six-pack abs with back pain or other injuries that are causes by muscle imbalances. Many people are training mirror muscles but don’t understand importance of stabilizing muscles and injury prevention. They will wake up only when injuries happen. Your body has two types of muscles – movers and stabilizers. The primary role of movers is to produce the movement while the role of stabilizers is to stabilize the joints and the spine during a movement. So, stabilizing muscles give support to the trunk and joints’ function by controlling and limiting extra movement. The movers are most prominent muscles in your body, but they cannot function well if the stabilizing muscles are weak. Too much movement (called instability) in the spine or joints (such as hips or shoulders) can cause pain, degeneration and poor biomechanics. When you move with good muscle recruitment, and stabilizing muscles are working well, there will be minimal wear and tear in your joints. However, stabilizer muscles are more than just injury prevention. They are reducing the waste of energy and muscles are working together more efficiently and more ergonomically. In the athlete’s world that means better balance, co-ordination, power and speed – they all need a good stabilizer muscles to produce superior performance. Core stability means an ability to contract the deep abdominal and back muscles – transverse abdominus and multifidus muscles. These muscles are responsible for stabilizing your spinal segments to help support your trunk in dynamic and static positions. The core is your “powerhouse”, the center of power. Core muscles’ strength and stability are important components to prevent injuries and back pain. Good core stability corrects posture and ensure more efficient and functional movement patterns of your other muscles and joints. 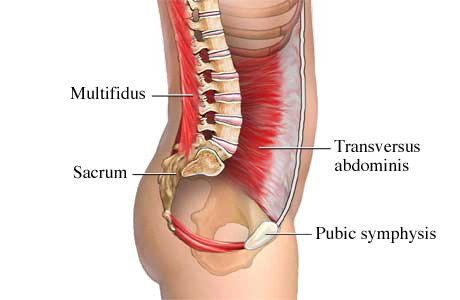 The gluteus medius and maximus muscles stabilize your hip joint and pelvic. By strengthening gluteus medius muscles will also help prevent knee injuries. When weak hip stabilizers exists, the iliotibial band gets overworked which can lead knee pain, iliotibial band syndrome (ITBS) or trochanteric bursitis. Knee joint stabilizers are more ligaments than muscles, but there are still quadriceps and hamstrings muscles that help stabilize the knee joint. Quadriceps include four muscles and two of them are more important to stabilize the knee joint – vatsus lateralis and vastus medialis. The iliotibial band also affects knee stability. The shoulder joint is most mobile joint in your body and needs a lot of stability to function correctly and prevent injuries. Prime stabilizer in your shoulder joint are the rotator cuff muscles: supraspinatus, infraspinatus, teres minor and subscapularis. These muscles are holding the ball of your shoulder joint tightly against the socket when shoulder is moving. Weak or fatigued rotator cuff muscles can lead to soft tissue injuries, like shoulder tendonitis and bursitis. The muscles that move the shoulder blade also play a role in stabilizing the shoulder joint. The muscles that attach on the inside of your shoulder blade (scapula) are the key muscles for scapular stabilization. These include the middle and lower trapezius, rhomboid major and minor, and serratus anterior. The scapular stabilization is essential in preventing shoulder injuries. Pilates is a good lumbar spine and joints stabilization exercise method, its’ foundation is strengthening stabilizer muscles. The main focus is on keeping your pelvic and spine stable while other parts of body are moving. You are contracting the deep stabilizing muscles, transverses abdominis and multifidus so that superficial muscles (movers) of the extremities have optimal coordination and motion. The core stabilizers are present in all Pilates movements but it also strengthens your shoulders, shoulder blade and hip and knee stabilizers. Pilates help achieve and increase quality of movements and functions of all joints and muscles, from head to toe, by creating body awareness, co-ordination and endurance. Pilates is a good exercise for injury prevention as well as to improve your optimal sport performance. For more about PilatesWise program for Athlete please check out our youtube video and click HERE. All Pilates sessions are taught by a Physical Therapist, she is also specialized in sport injury rehabilitation and post-rehabilitation after surgery and physical therapy. PilatesWise “Pilates training & exercise therapy” program is bringing the gap between injuries and fitness. Pilates for Rehabilitation- Does It Work? Today the Pilates method is widely practiced for both rehabilitation and fitness. Physical Therapists are recognizing Pilates as one of the most successful methods to treat many injuries, spinal disorders and joint diseases. However, Pilates rehabilitation is not only limited to just orthopedics and spine health but it also benefits individuals with neurological problems (MS), chronic pain (fibromyalgia), women’s health needs (menopause, osteoporosis, pre/post natal), performance enhancement needs (athletes), arthritic impairments (osteoarthritis, rheumatoid arthritis) and other movement dysfunctions. How does Pilates method work? Pilates therapeutic exercises focus on individual asymmetries in flexibility, strength and muscle recruitment patterns. Pilates trains several muscle groups at once through smooth, continuous movements. By developing a proper technique, clients can actually re-train their body to move in safer, more efficient patterns of motion. No other exercise form is so gentle to the body while giving it a challenging workout! Professional Pilates instructors give great attention and facilitation to you to gain strength, coordination, control and function in your weaker or injured muscles and joints. Pilates exercise not only leads to improvement at the injury site, but also improves your overall strength and function. However, it is important to note that most Pilates instructors are not trained to work with rehabilitation. Always ask your instructors’ qualifications and beware of those Pilates instructors who don’t have real clinical knowledge and skills about your injuries or diseases. Done improperly, some of the Pilates exercises can slow down the healing process or even be contraindicated. A good Pilates instructor with rehab background can help you to balance your body both physically and mentally and successfully support your healing process. Pilates is a mind and body method and a great natural alternative treatment or those who are looking for a different rehabilitation way. And the best thing is – it’s works too! For more about Pilateswise rehabilitation program, please visit our website and click HERE.